"When cooking without meat, or even with meat, nuts and dried fruits add a deep flavor and layers of texture plus good nutrients"
Mollie Katzen is the author of one of the best-selling vegetarian cookbook of all time (the famous Moosewood Cookbook). However, being considered the most influential personality of vegetarian cuisine in America does not prevent her from using meat in some of her culinary creations. 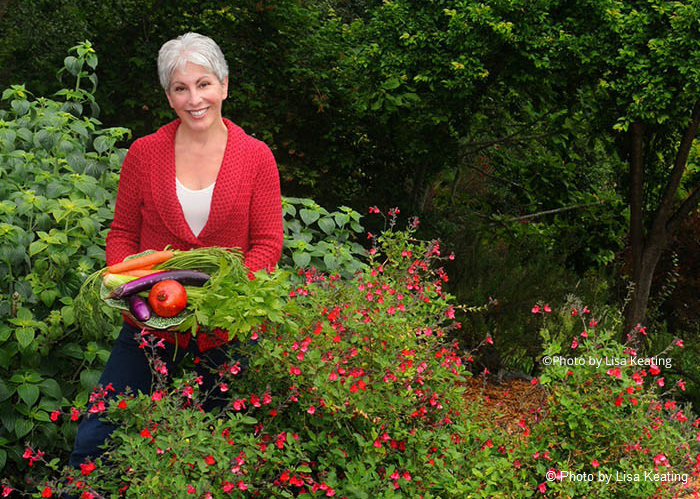 With a combined six million copies in print, Mollie Katzen has been named by Health Magazine as “one of the five women who changed the way we eat”. After publishing 12 books in the last three decades, she likes to present herself as a cookbook author instead of a chef. Readers will note that Mollie Katzen cannot deny the great influence art has played in her career. Indeed, she is the author of the artworks adorning some of her books. Simple and basic, featuring vegetables and fruit in season, legumes, whole grains, nuts, herbs, and healthy oils. Which has been the main contribution you brought to vegetarian cuisine? I was one of the early cookbook authors to publish vegetarian cuisine before it was known as a cuisine. How has the food industry evolved since the Moosewood Cookbook was first released in the 70s? Healthy plant-based cooking and eating have been embraced, and people have moved away from needing to have a large (or any) portion of meat at the center of the plate. For current generations, is vegetarianism a way of life or just a passing trend? I think that eating more plants and plant-based food is a way of life and not a passing trend. Meat may come and go, but the plant orientation will likely stay. I am actually not a chef. I am a cookbook author. My interests center on art, literature, music and philosophy in addition to food. Apart from a distinguished cookbook author, Mollie Katzen is an artist. What has resulted from the fusion you have made between fine arts and cooking? You are very kind. The fact that my education was in fine arts, in particular, painting and drawing, led me to approach food from a very visual angle, and the natural beauty of the plant world dovetailed perfectly with this. I believe that the dinner plate should be beautiful and compelling, and that people eat “with their eyes” as well as with their other senses. Who would you define as the person inspiring you the most in your career? Anna Thomas, author of The Vegetarian Epicure. Pre-packed foods is a category growing fast in US supermarkets. How can we encourage people to cook more at home? Acquaint people with the joy of a good, sharp knife! I do believe that is the key. Lots of green vegetables, ideally from my garden, prepared with a very good olive oil and some garlic. A little bit of pasta (about half the volume of the vegetables) and some roasted walnuts and diced sweet tomatoes, if in season. What is the role nuts and dried fruits play in your cuisine? Nuts and dried fruits play a very large role, walnuts especially. When cooking without meat, or even with meat, they add a deep flavor and layers of texture, plus good nutrients. I like to use dried fruit as a counterpoint to strongly flavored bitter vegetables to balance out the taste and make things more interesting and sometimes even playful. They can give a good edge to the flavor. Do you have a special way to combine nuts and dried fruits in your culinary creations? I am very flexible with these favored ingredients, and like to switch up the combinations in many ways. There are no rules! One of my favorite contexts for combining nuts and dried fruit is to toss them into cooked rice or a cold grain salad.